One of my favorite things about the holiday season is all the movies that come out. At the top of my list this year wasn’t a would-be Oscar contender, nor was it a certain highly-anticipated sequel. I was most excited to see Tina Fey and Amy Poehler reunite for Sisters. The film gave me and one of my best girlfriends the opportunity to take in a light-hearted movie and relax in the midst of the holiday maelstrom. I perked up in my movie seat when Fey and Poehler were shown getting their nails done in the film. After all, the two sisters were preparing for a huge party, which included every other element of the getting ready ritual (new clothes, hair extensions, etc.) to be shown onscreen. But then I quickly started to cringe. Poehler begins to interact with her nail tech, Hae-Won, by asking her questions about her job. 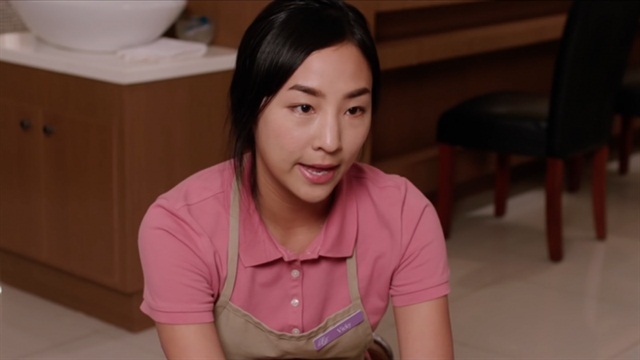 It becomes apparent that Poehler’s character assumes Hae-Won (played by Greta Lee) is working in sub-par conditions for reasons none other than her being a Korean nail tech. Luckily, the focus of the scene shifts when both Poehler and Lee’s characters struggle to pronounce the other’s name. What ensues is a verbal mispronunciation throw down of hilarious proportions. This exchange too could have been an uncomfortable one, especially after all the attention the consumer press gave Korean salon workers in 2015. Yet, the plotline propels forward in an unexpected way when Poehler’s Maura tells Fey’s Kate that she should work in the salon since she has a license to do nails. Up until this point in the film it is hinted that Kate is a cosmetologist (through a rather unfortunate eyebrow incident), but it isn’t until she asks the owner for a job doing nails that we get our proof. As a viewer, I loved the wacky dynamics of the salon scene. As someone who works within the nail industry, I was more relieved to see the scene not end with the emphasis on Hae-Won’s name and working conditions. I was glad it got pointed out that Kate does nails too, to subvert any racial stereotypes. What was even more rewarding though, was the film’s ending, part of which takes place at the nail salon. I don’t want to give away too much, but suffice it to say that everything ends happily for both Kate and Hae-Won. Actress Greta Lee agrees. She told The New York Times that she didn’t think her role as a Korean nail tech was racist. “I think it would be one story if she started out that way in the film and ended there, if she didn’t turn out to be who you saw her to be [by the end],” she says in this interview. This isn’t the first time Hollywood has used the role of nail tech as a funny and uplifting one (see a couple of my favorite examples Legally Blonde and Juno). So if you’re in the mood for some laughs, I definitely recommend seeing Sisters. However, if you’re in the mood for a serious discussion of nail salon/nail technician stereotypes, I welcome those comments too. Did you see this movie? Did you feel it perpetuated stereotypes? Do you have another favorite movie moment featuring a nail tech or salon? Feel free to share any of your thoughts in the comments below.